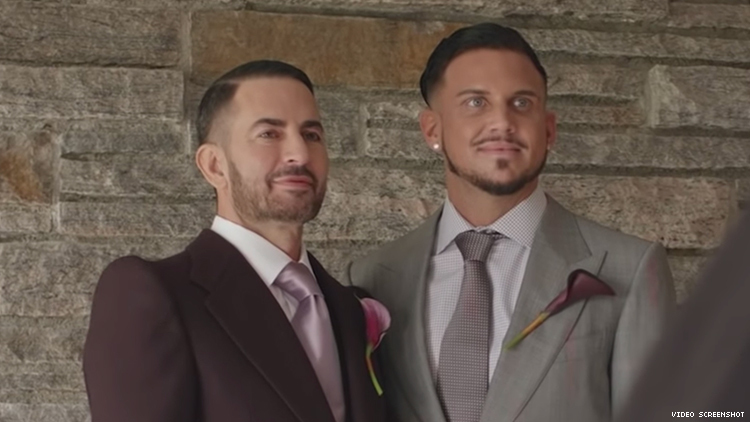 UPDATE: At the reception of their wedding Marc Jacobs and his fiance Charly Defrancesco screened a film of some of their most loving moments. Now with additional footage from the exchanging of vows, the designer has released the film publicly. ORIGINAL: Marc Jacobs wed his fiance Charly Defrancesco on Saturday. And while the pair got engaged last April at Chipotle with a flash mob helping to pop the question — a true designer of the people — they went full decadence for the big event, threading together the most iconic guest list of any event in quite some time. But first, the details. The pair wed at The Grill in the skyscraping Seagram Building in New York City wearing bespoke (What else?) suits from Savile Row’s Huntsman tailors. Jacobs himself wore a pair of Gucci boots while Defrancesco, who is a candle maker, wore a pair of Christian Louboutin high tops — red bottoms, bloody shoes. The looks were completed by matching penguin pins, as the species are monogamous and mate for life. “A great example of faithfulness and fidelity,” Jacobs wrote on Instagram in a tribute to Fabio Zambernardi, design director of Prada and Miu Miu who created the accessories. The car: a 1962 Rolls Royce Phantom. The cake: five layers and brought in by a group of dancers. The guest takeaways: a Scott Campbell-designed hoodie featuring two linked otters and some vape pens. And now for the guests. As both fashion designer, celebrity and gay icon, Jacobs’ wedding was a bit like a gay Met Gala. Fashion elite like Anna Wintour, Hamish Bowles, Katie Grand, Naomi Campbell, Bella Hadid, Gigi Hadid, Kaia Gerber, Kate Moss and more were there. As were other celebrities like Luka Sabbat, Chloe Sevigny, Erika Girardi, Lil’ Kim, Justin Theroux, Rita Ora, and Bette Midler. And then there were the drag queens — the couple is a fan of RuPaul’s Drag Race. Miss Fame, Manila Luzon, and Detox all made appearances. If we had to have FOMO for literally any event this year, it’s probably this one.